Today, the first meeting of the XAC, the XBRL Advisory Council to the IASCF took place in London. It was a very interesting kick-off meeting, indeed! To use an IT metaphor, I like to think of Accounting Standard Setting as constructing the Operating System that the economy works on. A principles based system such as IFRS can rely on a certain degree of fuzziness and the human factor when preparers and auditors apply the standards. But when this fuzziness actually is being translated into code, then a lot of nitty-gritty stuff appears. During the meeting, I first got my hands on a copy of XBRL for dummies, and since the book kindly features this blog (so, it's got to be a really good book, right? ), I thought I'd return the favour! IZS has made available the presentation slides from its recent annual conference about cross-border retirement provision from a Swiss perspective. It's a pity that the most interesting presentation seems to be missing: Klaus Stiefermann of a.b.a. talked about the Pensions Directive: godsend or letdown? As he was speaking from a distinctly German perspective, it will not come as much of a surprise that he tended towards the latter. On the occasion of last month's conference last month, EFRP presented the results of a member survey about the Pensions Directive. The Federation underlines the innovative nature of the Directive and suggests that the legislative review which is planned by the EU Commission for next year is premature since the Directive has not been given enough time after implementation. There are a number of interesting comments on important "details" such as mandatory second pillar, or that there are more than 48 cases of cross-border pension plans as reported by CEIOPS earlier. Very commendably, EDHEC Risk has decided to make the full documentation of its recent Alternative Investment Days 2007 available to the general public. This includes the much discussed - and dearly sold - paper about passive hedge fund replication as well as a lot of other interesting stuff. Wilshire has a fairly interesting white paper out with the title Commitment-Driven Investing (CDI): LDI as We 'C' It. The paper's rather semantic focus on commitment rather than liability is probably a consequence of its US accounting context, so we are not going to hold that against it. The thrust is certainly correct, namely that CDI, i.e. the Wilshire variety of LDI is aimed at managing the true economic funding ratio of pension plans and is therefore inherently a risk management technique. Confusing at best however is the frequent reference to two equally important (but partially conflicting) goals of CDI, whereas the only correct objective (from the sponsor's perspective) must be to minimise the cost of running the plan at a given level of benefit security. Also, the authors seem to be struggling - quite fashionably, one might add - with the rationale behind marking-to-market of pension liabilities. The impending revision of IAS 19 will deal with that issue. Their conceptual conclusion, nevertheless, is an intriguing one: The commitment discount rate is set to be a random variable described by the expected inflation characteristics of the individual plan's benefit stream. This is where the authors can start their optimisation engines, hopefully without being blinded by the light of past correlation stability. While we feel more comfortable with the more comprehensive approach recently proposed by Waring & Siegel, the authors deserve a prize for originality as this paper is the first that I know of to include the complete lyrics of a Springsteen song. The International Accounting Standards Committee Foundation (a.k.a. IASCF) today announced the formation of an XBRL advisory council, which I have the honour to say that I am a member of on behalf of the CFA Institute. I am looking forward to contributing my small share to the further establishment of XBRL as a major agent of change in the preparation, dissemination and use of financial reporting. epn has an interesting story mostly about the competition between asset pooling locations in Ireland, the Netherlands and Luxemburg. The Belgian approach with its relaxed solvency regime gets bad marks, especially with regards to next year's Commission review of the Directive and its transposition. Standard & Poor's has an interesting update of its Global Graying Report, which projects the current fiscal policy stance in conjunction with forecast demographic expenditures to arrive at hypothetical future ratings. It is a pity that Switzerland is missing from the simulations - France for instance goes from AAA today to Speculative in 2040. Well known Swiss accounting and pensions expert Carl Helbling has a highly relevant piece on the valuation of Swiss pension schemes. In it, he comes to a rather disturbing conclusion: "Accounting standards IFRS and Swiss GAAP FER are too undifferentiated and can only be a limited basis for valuation [of pensions]." He lists a substantive number of instances, where, for legal reasons, apparent over- or underfundings of Swiss plans cannot be utilised as expected economically. Thus, accounting numbers may be substantially different from effective values. Now, this is not exactly news as IAS 19 is hardly known to reflect economic reality thanks to its built-in shortcomings. But the instances listed do not even appear to be related to IAS 19 features to start with, but rather to what needs to be considered as accounting artefacts in the light of (legal) reality. One wonders how such numbers can be presented as true and fair? The Swiss CFA Society claims to be the world's first association of financial analysts to endorse XBRL by making its own financial reports available in that format. As there is still no XBRL jurisdiction in the Swiss market, such endorsement and awareness building is of the essence. Deutsche Bank Research has a comprehensive piece about sovereign wealth funds, including an overview of the most important funds, their systemic risk factors and of control mechanisms for foreign direct investments. Deutsche asks for increased transparency and a global code of conduct for such vehicles - both highly sensible petitions. CFA Korea Society has been so kind to invite me to talk to them about pan-European pensions and the conclusions to be drawn from European experience in the light of the very recent introduction of occupational pensions in Korea. Here are the slides of that presentation. A few days ago, I've had the honour to address the first IASCF conference in Asia in Singapore with a presentation about the CFA Institute's Comprehensive Business Reporting Modell in its final version. The CFA Institute Centre is asking for comments on its Code of Conduct for Members of a Pension Scheme Governing Body until 15 August. The draft has been prepared with the assistance of the OECD and major trade associations from the Hong Kong, the Netherlands, Switzerland, the UK and the USA. The CFA Centre has just given us a preliminary review of 2007 XBRL awareness survey results. From this preliminary review, it is not clear which subset of members have been sampled (yours truly cannot remember having been on it), or what the response ratio was, but a number of interesting points arise, especially in comparison with the results of the May 2006 quick survey. The majority of analysts is still unaware of XBRL. The percentage reported is even greater than last year, but that's pretty certainly within the margin of error. Analysts think the convergence of taxonomies - in line with the convergence of reporting standards, presumably - is very important. Analysts value increasing information granularity, even of details included in footnotes. Just tagging the note will not do. Analysts are wary of X, i.e. the eXtensibility in so far as they think that preparers' ability to extend the taxonomy ought to be limited and should follow a strict protocol. As the number of XBRL-aware respondents to the survey (ca. 240) seems to have been quite small, the validity of the answers to the more specific questions may have to be taken with a grain of salt. 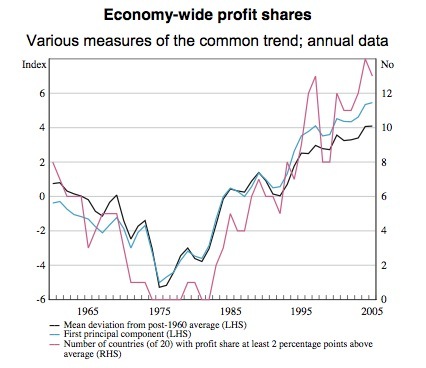 The BIS has an interesting working paper #231 on The global upward trend in the profit share. 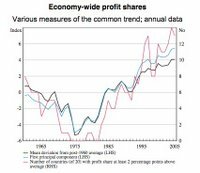 The paper addresses the rising share of value added going to capital rather than labour, a trend which is in evidence since the mid-1980s. The authors claim that this is not a cyclical development (unless you take Kondratiev-cycles into consideration, which they do not), but a fundamental shift explained by faster technological obsolesence of capital goods. The implications of this assessment are far reaching, not least with regards to the sustainability of equity valuations. Allianz Global Investors has published a 96-pages comprehensive report about the pension systems and markets in Bulgaria, Croatia, the Czech Republic, Estonia, Hungary, Latvia, Lithuania, Poland, Romania, Slovenia, and Slovakia with individual country profiles. This report is very useful due to the changing landscape in that region of the continent, combined with the unconventional pillar terminology utilised. The EU Commission has sent letters of formal notice to Italy and Finland about their rules under which dividends paid to foreign pension funds may be taxed more heavily than dividends paid to domestic pension funds. Italy and Finland are asked to reply within two months. These letters constitute the first step of the infringement procedure of Article 226 of the EC Treaty. Similar letters have been sent to the Czech Republic, Denmark, Spain, Lithuania, the Netherlands, Poland, Portugal, Slovenia and Sweden on 7 May. For those happy few of our readers with only a cursory interest in pensions accounting, KPMG's IFRS Briefing Sheet summarising IFRIC 14 on IAS 19 might just do the job. UK pensions to become mandatory? The new Pensions Bill will ensure that for the first time not just some but all working people have the right to a workplace pension with a duty on every employer to contribute towards it. We can only interpret this to mean that occupational pensions will go from contingent to mandatory for everyone in the UK. The implications of this change for the European first and second pillar classification, which critically relies on the non-mandatory nature of occupational pensions in contradistinction to social security, may be huge. This criterion, which is dispensable in our view, would be a major technical impediment to the eventual application of the Pensions Directive to Switzerland with its mandatory occupational pensions system. Pension liabilities heavily depend on forecasts of the mortality of the pension plan beneficiaries. These forecasts are produced by actuaries. Until quite recently, the actuarial science was deemed to be capable of coming up with a reliable point estimate (if you can speak of point estimates in the context of large cohort mortality tables) of future mortalities. This expectation does not survive under closer scrutiny of course. That is not a bad thing, because point forecasts of the future are necessarily inaccurate, therefore such expectations were never realistic. The British actuarial profession is leading the pack again with its publication of a draft library of mortality projections, indicating that it may be reasonable to utilise a number of scenarios in mortality projections. But more closely to home, and indicative of imminent changes to current mortality assumptions and thus liability valuations, they warn that currently employed mortality tables may considerably underestimate improvements in future mortality. 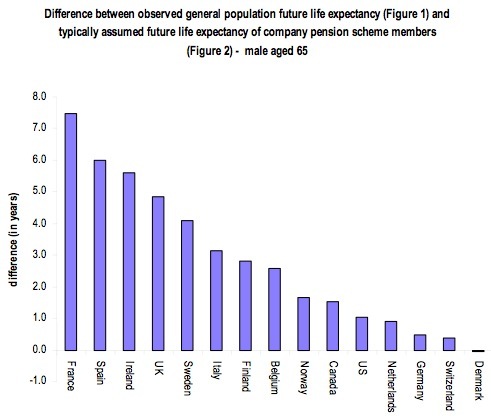 We understand this to imply that more realistic tables will assume higher average life expectancies and, consequently, higher pension liabilities. The largest asset that most human beings have, at least when they are young, is their human capital— that is, the present value of their expected future labor income. Human capital interacts with traditional investments, such as stocks, bonds, and real estate, through the correlation structure. But human capital interacts in even more interesting and profitable ways with life insurance and annuities because these assets have payoffs linked to the holder’s longevity. The authors of Lifetime Financial Advice present a framework for understanding and managing all of these assets holistically. This complex issue is approached in a systematic, model based fashion from the perspective of the individual investor. It may not, therefore, hold as much interest to the traditional institutional investor managing retirement monies collectively. Private wealth & insurance product managers should be able to find plenty of food for thought, though. But not only them: this short monograph should be essential reading for everyone who needs to be financially literate. In a recent speech, the president of the Dutch central bank has presented a concise and well structured comparison between US and Dutch occupational pensions. He particularly focused on the benefits of a legal separation between sponsor and pension fund as well as on the advantages of professional asset management which is supported by the more collective approach in the Dutch system. IFRIC, the International Financial Reporting Interpretations Committee has issued an important interpretation of the limit on an asset recognised in the surplus of a defined benefit plan under IAS 19. Especially the treatment in the presence of minimum funding requirements is of interest in the European context. IFRIC 14 is only available to eIFRS subscribers, but its draft is openly available. CEIOPS invites comments on its Consultation paper to establish a non-binding mediation mechanism available to supervisory authorities under the directives within the Committee's purview. The mechanism is proposed to work with an accept or explain approach, thus forstering transparency. However, the issue that might be considered to be most in need of mediation (i.e. different funding requirements in Belgium and the Netherlands) appears not to fall within the scope of the mechanism. In an important decision in case C-522/04 Commission vs. Belgium, the Court's second chamber has found, among other things, that Belgian tax provisions effectively taxing retirement capital to be transferred to an IORP resident outside of Belgium to be in breach of several Treaty freedoms (recital 40) and therefore inadmissible (IPE). This is the first decision dealing with an issue that is critically important to the establishment of cross-border pensions, and its favourable, albeit unsurprising outcome virtually removes yet another area of legal uncertainty. It is interesting to note that the Court evaluates the equivalent applicability of its reasoning to the EEA, which it confirms. KPMG UK has an extensive new report about accounting out. It is a collection of essays from accounting dignitaries across the world and across different stakeholders, covering all relevant topics in accounting now that the first IFRS reporting period has been completed in the EU. On the occasion of the Swiss CFA Society's celebration of the CFA Institute's 60th anniversary, I've been asked to host a panel discussing Education & Innovation in Switzerland. 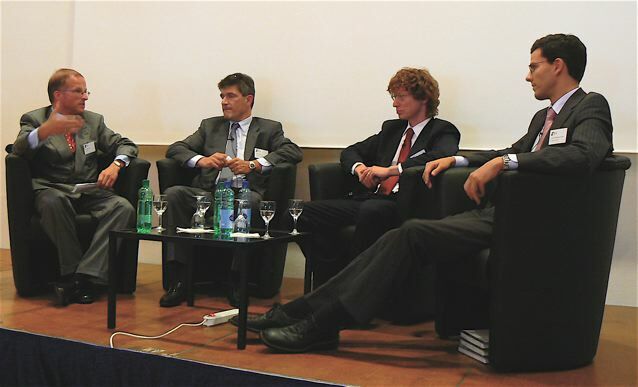 The panel was composed of Prof. Manuel Ammann, Prof. Thorsten Hens and Patrick Odier (right to left). The debate covered topics such as Swiss pragmatism in adopting innovation invented elsewhere, the rôle of intellectual property in financial innovation as well as ways to bridge the gap between academic research and practice. Panelists would like to see increased flexibility in the educational landscape and more interaction between the two quite separate fields. While The Economist's gold standard attribution to the CFA designation is still unmatched for sheer quotabiliy, the Financial Times' latest Financial Training Report makes up for volume since it is almost dedicated to the CFA. Here's a little excerpt: The CFA qualification can give the masters of finance degree a run for its money. Already in early March, CEIOPS reported the status of cross-border IORPs that were active by the end of January 2007. For some reason, this has escaped our attention to date, which is quite unforgiveable since it is an interesting statistic. Of the 39 institutions reported, 77% have been in operation prior to the Pensions Directive's entry into legal force. Only 9 are "new" IORPs, located in Finland (1), Germany (1), Ireland (4), Luxemburg (1) and the UK (2). Notably absent from that list are Belgium and Liechtenstein, but we would wager that the "many new cross-border IORPs" anticipated by CEIOPS should change that ranking fairly soon, especially since Belgium is a relatively late arrival in terms of directive transposition. We hope that this statistic is updated periodically, for instance quarterly. CEIOPS also notes that the Budapest Protocol of supervisory cooperation works well, but that "some features of the IORP Directive might benefit from further clarification". That would be the steady state equilibrium size of a Finnish model pension fund, assuming an elderly dependency ratio of 44% by 2050, up from currently about 23%. This is one of the interesting numbers that yet another central banker, Mr Erkki Liikanen of the Bank of Finland, has quoted in his recent address to the Conference of Social Security Actuaries and Statisticians. There is a lot of interesting food for thought in that speech. I have just one question mark concerning the conclusions, where Mr Liikanen claims that "the volumes needed for financing pensions mean [that] the system will always have to be based on a public PAYG scheme". We think that always is an awfully long time. Mr Liikanen does not specify why funded systems should be unable to reach the required level of funding in the course of a generation or so. lack of large multi-employer DB plans. We agree with both parts of the analysis, namely that DB plans are preferable to DC, and that there is currently a lack of incentives for DB plans. We strongly disagree however with Mr Dodge's opposition to fair value accounting. He claims, essentially, that we are not interested in today's values, but in expected values far into the future. We think that analysts of pensions are very much interested in today's values. For one, every expected future value can be discounted to a current present value (assuming that the term structure holds). Thus, Mr Dodge's distinction would essentially become moot. More importantly however, it is not at all clear at which specific point "far into the future" the expected value would need to be formed - surely that cannot be discretionary? How about changes to those expected future values, based on variations of underlying assumptions? Finally, the volatility introduced to sponsors' balance sheets is not artificial, it's an economic fact. Cognition of that fact is a prerequisite of sponsors' ability to manage the inherent economic risk of their DB plans and, therefore, an enabler of an effective defined-benefit pension system. "Pensions are being transformed from off-balance sheet operations with results smoothed over many years, to large consolidated business units with high potential short-term volatility, bringing them to center-stage for executive managers." Earlier in the year, JP Morgan has come up with a white paper that is very much in line with our thinking: Corporate Finance meets Pension Management: A new era for pension leaders. The paper is obviously targeted to the US market struggling with implementing the Pension Protection Act of 2006 and US GAAP SFAS 158, but as accounting (and regulation) follows economics in Europe, too, Europeans are well advised to consider this a sneak peek preview of their own not too distant future. NZZ reports the results of a survey among 172 Swiss institutional investors with CHF 211.7 Bio (EUR 128.3 Bio) assets under management. They have been asked to give their opinion on the rather restrictive set of detailed investment rules applicable to Swiss occupational pension funds. A majority of funds voiced their preference for the prudent investor rule to replace the incumbent detailed set of rules. The available exemption from detailed rules of Art. 59 BVV2 is reported to be used by 80% of funds and thus has become the rule. Unfortunately, detailed results of the survey appear not to be available online. On Tuesday this week, I had the pleasure to give a presentation on occupational pensions to the members of CFA Russia in Moscow. The presentation has been recorded and will be made available on their soon to go live website. Meanwhile, the slides are available here. According to VF, ASIP's new president Christoph Ryter named opening up of Switzerland for European retirement solutions as one of four main challenges that the influential Swiss association will have to live up to during his presidency. IPE refers us to an interesting OECD study modelling the optimal asset allocation for an identical pension fund, over a 30-year period, according to the regulations of five OECD pension jurisdictions. It found an identical pension fund which was fully funded according to UK standards would appear 87% funded in the Netherlands and 69% funded under German rules. Optimal asset allocation strategies also differ between the jurisdictions. Since good regulation should at least attempt to not distort economic reality, this certainly looks like an interesting paper. Some will find this excessively dogmatic, but I still subscribe to the view that there is no conclusive evidence yet of the need for hedge funds (meaning active absolute return strategies) in the institutional asset management business. To provide such evidence, it would be necessary to demonstrate that hedge funds' risk-adjusted performance after fees is located on the efficient frontier over an entire market cycle, and that would have to hold in the present constellation with relatively huge allocations to the segment. In my view, hedge funds are perfectly appropriate for private wealth because of individual investors' known disproportionate avoidance of loss. In the case of institutional investors whose equity is subject to volatility of assets and liabilities, absolute return strategies may be net inefficient at best, or they may even create additional asset/liability mismatch and thus be entirely counter-productive if considered from a comprehensive balance sheet risk management perspective. That being said, the traditional distinction between hedge funds as providers of absolute return strategies on the one hand or alpha engines on the other becomes increasingly blurred. It is therefore advisable to keep a close watch on the industry, especially given the recent competitive pressure on excessive and asymmetrical fees exerted by institutional investors (epn story). As indicated earlier, some stereotypical anti-competitive reflexes begin to rear their ugly heads in the wake of the open conflict between Belgium and the Netherlands on pensions regulation. The President of DUFAS asks for a war on regulatory arbitrage, which can be translated into war on competition, of course. This brings the Pensions Directive to a critical juncture in its application relatively early on - here's to hope that the Commission will handle this diligently. One is tempted to refer the Dutch back to the basics of the Cassis de Dijon principle and following jurisdiction. Applied naïvely to IORPs and the Pensions Directive, that principle would entail that the set of regulatory norms (for instance lower solvency) deemed sufficient by one member state's authorities needs to be recognised by every other member state (with the famous exception of measures required for the "effectiveness of fiscas supervision, the protection of public health, the fairness of commercial transactions and the defence of the consumer", of course). Therefore, regulatory arbitrage is part & parcel of the Pensions Directive. The only alternative is harmonisation of occupational pensions, and that is what member states shied away from at the inception of the Pensions Directive. The OECD has published an interesting protocol of an online debate with OECD economists about the pensions challenge. There's plenty of materials and food for thought there, especially in the background readings listed, or the annuity debate; one wonders whether the lack of private annuity products may not to some extent be due to an effective crowding out by mispriced public policy alternatives - but unfortunately that question is not touched upon. McKinsey has an interesting Chart Focus displaying the mitigating effect of direct & indirect policy measures on the opportunity cost to growth of ageing societies. By far the largest effect could be had in Germany by raising the average rates of return on savings, which would not appear to be outlandish, given the notoriously conservative nature in which German savings tend to be invested. Immigration and higher fertility pale in comparison. Evidently, the cross border competition for locating IORPs starts having an impact - at least, that's the impression you get when reading this story about the Dutch central bank lambasting neighbouring Belgium's new (and competitive) pensions regulation. We wonder for how long the Commission will be able to uphold its politically highly sensitive stance of tolerance towards regulatory & supervisory shopping - which is conceptually at the core of the Pensions Directive. P.S. Naturally, the Belgian response wouldn't be too far out. IPE has an interesting story about the recent foundation of Institutional Life Markets Association (ILMA), a non-profit trade association to “encourage best practices and growth of the mortality and longevity related marketplace”. Founding members of this potentially highly relevant association are Bear Stearns, Credit Suisse, Goldman Sachs, Mizuho International, UBS and West LB AG. The association does not appear to have a website, yet. The CFA Magazine often is a good source of interesting material, written in a competent, yet conversational style. Cases in point are Stephen Brown's article about RIXML, an electronic data format similar to XBRL, but specialising on research information and therefore not quite as pervasive as XBRL, and John Rubino's excellent piece about global liquidity, providing insights into the global yield curve and failing monetary policy in the presence of free flows of capital and the carry trade. Swiss pensions association ASIP has published a concise draft of a revised occupational pensions law to assist the ongoing debate about simplifying the overly complex current law. Surprisingly, this draft still does not refer to the prudent person rule in its asset management section. Encouragingly, the draft does away with politically set rates such as the conversion rate or the guaranteed minimum return. At the same time, ASIP has published the executive summary of a research paper examining the alleged over-capitalisation of the Swiss second pillar with a view to reducing the full coverage requirement. Some of the arguments proffered are truly surprising: foreign investments are used as evidence of an over-abundance of capital. Unsurprisingly, the authors conclude that there is no indication for too much saving and that it is reasonable to maintain the full coverage requirement. Mercer IC published its periodic asset allocation survey of European pension funds. Of the 651 funds surveyed, 75% still reside in the UK, thus the survey's cross country comparison may not be entirely reliable (via VF). Commodities investments have caught the supervisory eye, it seems. In its latest Quarterly, the BIS published interesting research about Financial investors and commodity markets. Specifically, it addresses the questions whether the exploitation of perceived profit opportunities by financial investors has fundamentally changed the relationship between prices and the physical characteristics of commodity markets and whether the broadening of the investor base has led to significant market deepening and hence affected features such as short-term price fluctuations. The latter question is answered quite in the affirmative, while the former is more difficult to address. The BIS notes a significant divergence of long-dated futures prices (in crude oil and copper) from estimates of current marginal production costs since 2003. In efficient markets, expected marginal costs should act as anchors for long-dated futures prices. However, the research offers several fundamental reasons for such divergences, hence they are not necessarily a consequence of portfolio investments. Its title may appear a bit facetious, but the latest issue of SwissRe's Sigma is anything but. It contains a comprehensive overview of the challenges to capital based retirement provision arising from increasing longevity. The prime focus of the publication is on insurers and insurance products, naturally, but most of its considerations and precepts are directly applicable to non-insurance pensions providers. A very worthwhile read for everyone in the retirement business! funds in the Romandie are quoted as more favourable to financial innovation. The only case in point given, though, is their elevated investment in ethical and socially responsible investments, which strikes us as an odd proxy for financial innovation. Altogether, Switzerland may be seen as representing both the anglo-saxon as well as the mediterranean approach to retirement provision in one small jurisdiction with a multitude of (cantonal) supervisory institutions. The UK Financial Services Authority has just issued a paper about risks and challenges in the growing commodities investment segment. Most of the paper is a wrap-up of conventional wisdom, but it is nevertheless worth mentioning that the FSA recognises the wide use of algorithmic trading (with associated technical risk) and that, surprisingly, UK pension funds are barely invested in this asset class to date. Consequently, the consensus view is that the growth of portfolio investment in commodities is set to continue. Sometimes, Poland can be a confusing country, especially when it comes to pensions. Therefore, it is valuable to have the occasional helicopter view paper, such as the IMF's recently published Technical Note on Competition & Performance in the Polish Second Pillar. The paper contains a description of the structure & function of the Polish retirement provision system in general and the second pillar in particular. That's where appearances can be confusing: The Polish second pillar is evidently not equivalent to occupational pensions in the sense of the Pensions Directive, which is why the Directive's investment guidelines are not directly applicable. Nevertheless, the systemic home bias of the Polish second pillar remains an issue, probably even a self-reïnforcing one thanks to the considerable asset accumulation in the industry. epn also has an interesting piece covering that issue. IPE reveals that Iceland is the latest (and last) EEA country to adopt the Pensions Directive into its national body of law. It will be interesting to observe how Iceland proceeds with the transposition given the Belgian example. The Icelandic Association of Pension Funds will certainly provide more background. Today, the 7th Annual Conference of the IEBA has been brought to my attention because of its several presentations about pan-European pension funds (scroll down to Past Events). While the presentations themselves did not strike me as out of the ordinary, I noticed the slides of an earlier event about mortality assumptions used in the EU. The slides present a good overview of this important paper. Most notable is the slide shown on the side. It displays the difference between observed and assumed future life expectancy of pension scheme members across a number of countries. The difference varies widely with Denmark, Switzerland & Germany showing the slightest differences whereas France, Spain and Ireland have the most "longevity reserves" built into their mortality assumptions: a plan using French mortality assumptions will show considerably higher liabilities than the same population of beneficiaries subjected to Danish assumptions. The Committee on the Global Financial System hosted by the BIS recently published a paper on "Institutional investors, savings and asset allocation". This paper tries to assess the impact of ongoing regulatory and accounting changes on the behaviour of institutional investors, whose assets under management are seen as rapidly catching up with those of the banking system, therefore warranting central banks' interest with a view to the stability of the financial system. The impact of regulatory changes on market rates and asset prices is another important consideration. The report's main theme is the ongoing transfer of risk from institutional balance sheets to the household segment. Two side notes on Swiss pension funds: Available information about their assets & allocation is two years older than other countries', and their equity exposure is considerably below average. Last Tuesday saw an interesting convention on the shores of lake Geneva at the sumptuous estate of Baron Rothschild and his company. The topic of the well attended conference was pan-European pensions in general and the Belgian incarnation thereof in particular. The list of speakers could not have been of higher calibre: The Prime Minister together with two cabinet ministers and high level representatives of the EU Commission and the Belgian pensions supervisor. Their objective was to introduce the Belgian legal framework for the newly created legal entity Organisation for Financing Pensions (OFP). They did this quite effectively, albeit on the only neutral territory in Europe where the Pensions Directive is not applicable. The OFP seems to be a highly attractive entity to provide pan-European pensions with. It operates on zero (income, capital, VAT) tax, it can provide solidarity across several pension plans (which is attractive for efficient capital allocation), it reflects no other restrictions on asset management than the Directive's prudent person principle, it may rely on Belgium's extensive network of double taxation treaties, it takes advantages of Belgium's recent transition to EET, it is not encumbered by a Pensions Protection Fund levy and last, but by no means least, the valuation of its liabilities may be based on a discount rate that incorporates expected returns, thus may go as high as 6%. A word of caution may be in order here, though: It is not clear whether the long term consensus expected return used to derive that attractive discount rate takes into consideration recent literature on the proper calculation of expected rates of return. Jean-Pierre Steiner of Nestlé Capital Advisers shed some cold water on participants' hopes that pan-European pension plans might fully replace local plans in the near future. In his view, this is an ambitious long-term objective reaching beyond his active lifetime. Nevertheless, he put Nestlé's considerable weight behind the support of Belgium as the currently most attractive location for pan-European pension funds. Also of interest was Mr Van Hulle, the EU Commission's representative's comment that he wasn't opposed to supervisory shopping, which is of course tantamount to regulatory shopping - something that tends to be frowned upon elsewhere. Equally interesting to Swiss listeners was Mr Wymeersch's note that Belgian first pillar institutions may be falling under the Directive, which seems to be in direct contradiction to the Directive's scope and is of particular interest to Liechtenstein as well. McKinsey Strategy has a good piece on why accounting shouldn't drive strategy, exemplified with pensions accounting. While I fully agree with that statement, I think it's quite idealistic to the point of being utopian. It would be utopian to expect of preparers that they wouldn't use the possibilities they have to look as good as they possibly can. A mild form of such behaviour would be just presentational, i.e. immaterial, but as we know, accounting often drives transactions without any real economic motivation. The only way out of this quandary is to devise financial reporting standards that make sense economically, i.e. under which you can only look good if you behave rationally economically. This is the purpose of the CFA Institute's Comprehensive Business Reporting Model with its thrust for full fair value accounting. That's when accounting comes full circle with enlightenment philosopher George Berkeley: Being is perceiving and being perceived. The January/February issue of the CFA Institute's Financial Analysts Journal is fully dedicated to pensions and retirement provision from an asset management perspective. Essential reading for all subscribers to this blog! IPE has an interesting story about German insurance LV 1871 bringing its pan-European pension fund to Liechtenstein. Other institutions are also confirmed to be interested in this location, which is entirely in line with our assessment of Liechtenstein as one of the competitive locations for European IORPs. KPMG has published the first edition of its M&A Yearbook 2006 which contains an overview of mergers & acquisitions in Switzerland in 2006. XBRL features as #10 (of 20) in the Harvard Business Review's List of Breakthrough Ideas for 2007. Other ideas we find particularly interesting are #4 (algorithms), #7 (partial attention), #13 (patriarchism) & #20 (accountabalism), of course. In another important ruling, the European Court of Justice rules against surprisingly recent Danish provisions (law of 2003) permitting tax deductibility of pensions contributions only for institutions located in Denmark in the case C-150/04 Commission vs. Denmark (assisted by Sweden). Continuing its standing practice, the Court relies solely on the Mutual Assistance Directive 77/799 without having direct recourse to double taxation treaties in order to refute the tax avoidance argument: Furthermore, it must be noted that the mere fact that a taxpayer makes contributions to a pension scheme taken out with an institution established outside Denmark cannot form the basis for a general presumption of tax avoidance or justify a fiscal measure which prejudices the enjoyment of a fundamental freedom guaranteed by the Treaty. With regards to the cohesion of the tax system, the Court shows that a country's tax system is only adversely affected if the future pensioner takes residence outside of said country before taxable benefits fall due. Since he is entitled to do so under the Treaties, the general refusal to grant a tax advantage is not permissible. Our earlier story seems to have been very topical. epn also has an interesting piece on the securitisation of longevity and recent developments therein. All this coïncides (probably not randomly) with an extreme mortality securities for some mortality risks in France, Japan and the US being successfully issued by SwissRe in November of last year. It was very interesting to contribute to the Greek Capital Market Commission's conference on the interaction between regulatory authorities and supervised entities and market competitiveness in Athens yesterday. Here are the slides of the short presentation, and this is an audio recording of it. The EU Commission swings into action with some treaty infringement related proceedings. It has decided to take Sweden to the ECJ about the country's practise not to grant tax deductibility for pensions contributions paid to insurers resident abroad (but within the EEA) in line with the EET principle. Strangely, there seems to be no reference to the Pensions Directive. In other news, the Commission is satisfied with recent modifications of Spanish legislation which also did not allow for tax deductibility of cross-border pensions contributions. The infringement case against Spain is therefore closed - in this case with reference to the Pensions Directive btw. Notably, the new Spanish tax rules explicitly allow deductibility for IORPs resident in the EEA, and specifically Liechtenstein, which removes an important legal uncertainty with Liechtenstein IORPs, at least with regards to their relation to Spain. There is no more appropriate way to start the first post of the year than by dedicating it to an early bird, even though the year is well advanced already. The early bird in question is Allianz with its European ComPension product, the first product that has been designed with a pan-European pensions market in mind. Meanwhile, we've had a bit of time to look at this interesting solution, which is only the first of several products that are currently under development, as we hear. European ComPension is a fairly plain-vanilla insurance retirement product that is available through Allianz's international network, but only in France, Italy and Germany for now. Unsurprisingly, it offers only DC solutions, although this entails a guaranteed minimum return in Germany. The pricing reflects the first mover advantage. Assets are invested in one of two new Luxemburg based Allianz Global Investors European Pension funds Dynamic or Balanced which invest in an opportunistic combination of Euro area stocks and bonds. Given the somewhat moderate pace of the market, I am not sure whether the first mover advantage is really that big in the case in point. European ComPension has obviously been designed from a network perspective so as to not cannibalise the network's incumbent business. As it is our view that the pan-European pensions market has the potential to disrupt insurance networks in that specific segment, it is probably unwise to choose such a development approach. While the choice of the development approach may be ill advised but comprehensible, it is hard to understand the investment strategy of the funds on offer. The geographic limitation of investments to the Euro area appears to present such a strong impediment to the portfolio's potential efficiency that one may wonder whether this is in line with the Prudent Person Rule at all.